Have you noticed lately that when you see pilots walking through an airport terminal they rarely seem to be carrying flight bags anymore? You remember, those large black suitcases usually covered in stickers which pilots would have hooked onto their rollaboards? Yes, it is true that most pilots are no longer dragging these heavy albatrosses around, but there's a reason for this. Those suitcases have been replaced by a device that's come to be known as an electronic flight bag (EFB). "Electronic flight bag" is a generic term for any device containing aviation data which is designed to be used in flight. Those ubiquitous flight cases that pilots used to carry around were filled with things like charts, approach plates and aircraft operating manuals. All of that data has now been digitized and loaded onto electronic flight bags. Now, instead of lugging around thirty pounds of paper, pilots need only carry a one pound device such as an iPad or Surface tablet. The idea of using a separate electronic computer on board an aircraft dates back to the 1980s when programmable calculators became powerful enough to do airplane performance calculations. Those calculations had been previously done through the use of finely detailed graphs and charts but the process was susceptible to human error and was horrendously slow. Back in the 1980s as a newly minted Air Force pilot flying the KC-135 aerial tanker, I disliked the "chase-through" charts so much that it was an easy decision for me to spend a few hundred dollars on an HP programmable calculator to do the takeoff data calculations. And believe me, that was serious money to a 2nd lieutenant. Many airlines first adopted onboard computers for calculating performance data, but as the computing and memory capabilities of portable devices increased, it became easy to see that EFBs could do much more. Even though the reduction of 60 or 70 pounds of weight between two pilots on the aircraft nearly justifies the expense of the devices, their benefit and potential extends far beyond mere weight reduction. Being information devices, EFBs have the potential to revolutionize the access that pilots have to things like real time ground based weather data as well as safety enhancements such as position location while taxiing using the device's GPS receiver. An EFB can contain not only manuals for normal and non-normal operation of the aircraft, but the entire library of reference and training materials that were considered too bulky and not essential for daily carry. Communications from airline managements to their pilots have also been enhanced by the use of EFBs. Traditionally, bulletins, announcements and policy changes were distributed by paper placed in a pilot's mailbox at their base or through a read-before-fly book in the pilot lounge. Now with electronic updating, information can be pushed to the devices at any time during a trip or on a pilot's days off. Obtaining real time weather information from ground based radar has never been possible while airborne, but that may be changing with the introduction of WiFi capable EFBs. The FAA still prohibits the use of any WiFi devices by pilots while flying, but should this restriction be eased, WiFi enabled EFBs will then have access to this data through the aircraft WiFi which will augment information from airborne radar displays. This will be especially helpful when trying to navigate around thunderstorms which can be opaque to aircraft radar. There are many different devices and configurations of EFBs in use but the FAA requires that any EFB in use must be verified to have the latest version of any charts or approach plates to be used. As updates to aeronautical information occur weekly, various methods of making sure EFB apps and the information they display are current are employed. Several different devices and data configurations are also used by various airlines. United, for instance, issues company provided iPads to its pilots which are locked so no personal apps or information can be added. Southwest reimbursed their pilots to purchase their own iPads which were then updated with the required EFB apps while still being unlocked for personal use. Delta made a decision to go with the Surface tablet from Microsoft and is currently petitioning the FAA for an exception to be made to cockpit WiFi prohibitions. 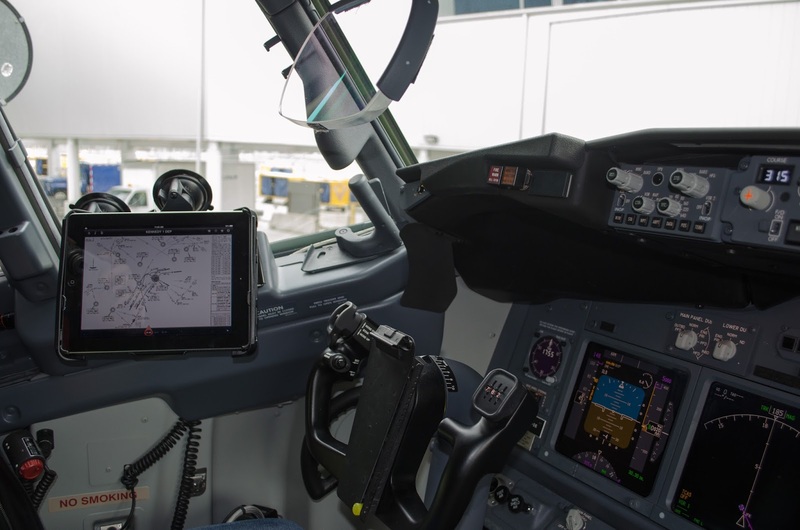 The end goal of the EFB is to allow cockpits to become completely paperless. Many airlines still use paper for weather packages, Notams, dispatch releases and minimum equipment list (MEL) documentation. 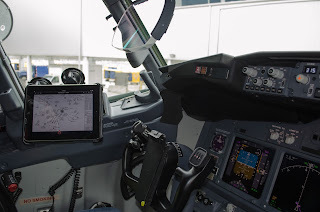 The future of the EFB is envisioned as being one stop shopping for any kind of information processing to be done in the cockpit. In the near future, pilots may see their dispatch release show up, check the weather, Notams and maintenance status of their aircraft and then add an alternate or fuel all through their WiFi connected EFB. I'm guessing, though, that we won't be approved to watch the game up front any time soon. Maybe just the highlights.